Pre-Fall 16 is currently in stores, replacing the rails of sales goods and looking entirely ripe for the picking. As your first dibs on the big new season ahead, you'll find there are some early trends you haven't quite geared up for (1980s-style strong shoulder pads, for example, may take some persuading), but there are plenty of easy new looks that can slide effortlessly, and very happily, into your existing wardrobes. It's a selection of these key ideas and pieces that one finds most commonly popping up in shop after shop. 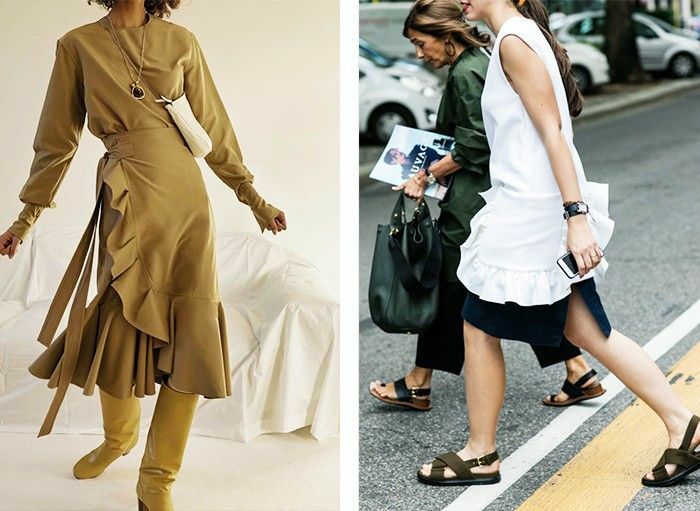 The buyers know what will sell and what to offer from the vast range that now makes up pre-fall, so it's interesting to see how their eagle eyes have focused in on certain similar trends—making them the most instantly shoppable. From the kind of new dress investment a girl should make (it's a really fun one) to the hot-ticket print that will carry you through from summer well into autumn, scroll down to see and shop the most popular—and important—moments of Pre-Fall 16. Style Notes: Frill-seekers rejoice, this is your season—yet again. If Phoebe Philo is experimenting with jumbo frills at Céline, you know it's still very much a fashion-forward thing to enjoy. We like her structural, tonal take on the idea, but feel free to mix it up with your existing day-to-day pieces. Style Notes: While leopard print and stripes are both gearing up for some major exposure for autumn/winter 2016, gingham is gaining momentum this summer. As you can see from Preen by Thornton Bregazzi's pre-fall lookbook shot, there's no shame in doing head-to-toe checks—but start by dipping a toe in like Camille Charrière and wear just one standout piece with your basics. Style Notes: Velvet is also a top-line trend for A/W 16, but the entry-point must-have is undoubtedly a pair of sumptuous velvet shoes. Every designer (both ready-to-wear and shoe-focused) is offering a pair in some form right now—The Row's Ava Mary-Janes have a growing fan club, as do Saint Laurent's Candy platforms. Style Notes: Making your wardrobe work harder 24/7, designers have really encouraged the concept of party dresses for day for pre-fall. This means taking something super-elaborate, that perhaps you wouldn't usually consider purchasing, and dressing it down entirely. Wear it layered with knitwear and/or trousers, pair it with clompy flats, don't wear makeup… Whatever you do, keep it casual.